Made with rich Gold Tequila, Triple Sec and our secret homemade sweet & sour blend. Served “frozen” or “on-the-rocks”. Offerings are Strawberry, Peach, Banana, Raspberry & Mango. Sauza Gold Tequila and Triple Sec. Sauza Gold Tequila and Grand Gala. 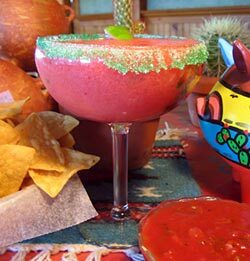 Sauza Gold Tequila, a blend of Watermelon Schnapps and Sam’s margarita mix. Served “on the rocks” or frozen with a festive sugared rim. Garnished with a slice of old fashion watermelon candy.